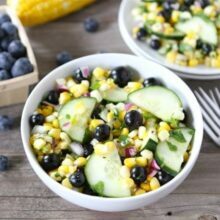 Fresh Corn Salad – this salad is light and refreshing, with a juicy pop of blueberry, cucumber crunch, and tons of flavor from cilantro, jalapeño, red onion, and honey lime dressing. Easy-to-make in advance or day of, this corn salad is perfect for summer parties. The weather is perfect in Salt Lake City right now, which makes me want to lay on a blanket in the grass and do nothing else. Well, I do want to make summer recipes because the summer produce is SO good right now! I can’t get enough. At the market, I picked up blueberries and sweet corn because they looked so good. I made one of my favorite simple summer salads for dinner – Blueberry Corn Salad. You guys have to try this fresh corn salad recipe. 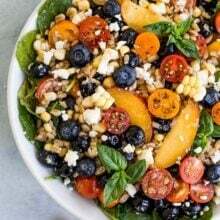 You might be thinking blueberries in corn salad? But YES, so much YES! This salad is light and refreshing. 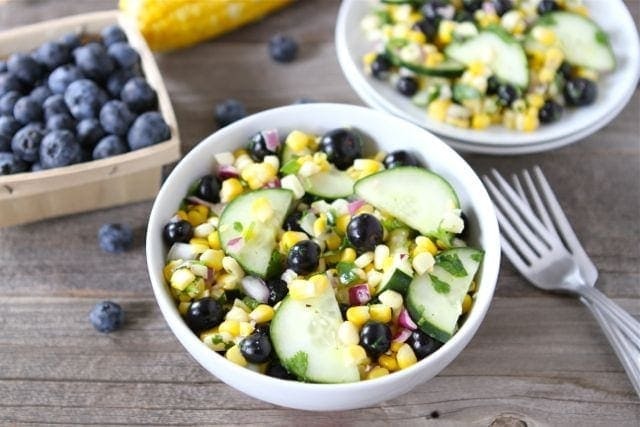 I love the pop of color and juiciness the blueberries add to the corn salad. The cucumbers also add a nice crunch. This fresh corn salad is full of flavor thanks to the cilantro, jalapeño, red onion, and honey lime dressing. Pro tip, you don’t need to cook the sweet corn. Remove the corn kernels from the cob with a sharp knife and add the corn to the salad raw. It is juicy, sweet, and SO good! If you can’t find fresh corn, you can use frozen or drained canned corn, but fresh really is best for this corn salad recipe. When corn is in season, I make this salad all of the time! I can’t get enough! 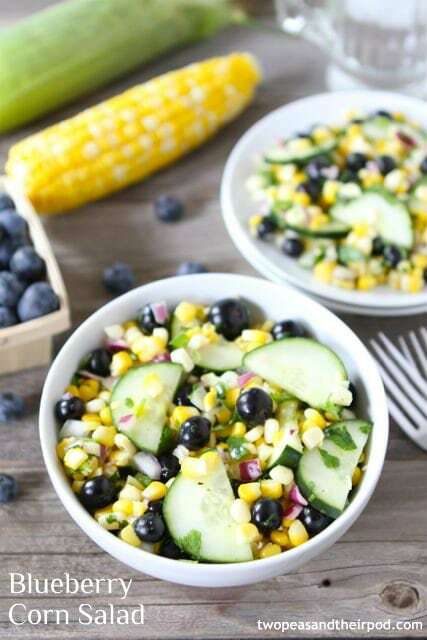 Celebrate summer by making this Blueberry Corn Salad. It is simple to make and it can be made in advance which makes it perfect for summer bbq’s, picnics, and pool parties. It is the perfect side dish to any summer meal. I guarantee it will become a favorite summer salad with your family, just like it is with ours! 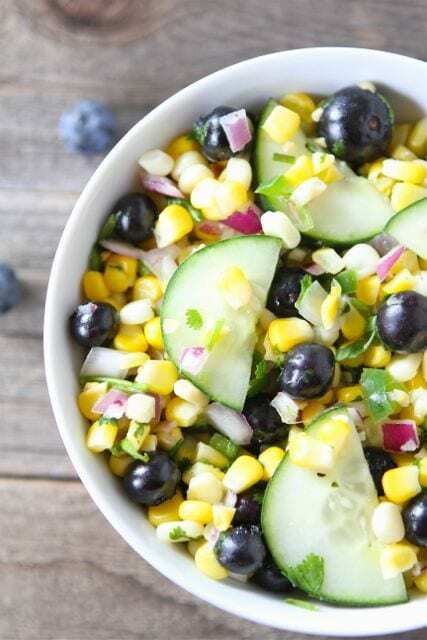 Simple summer salad with blueberries, sweet corn, cucumbers, cilantro, jalapeño, red onion, and a honey lime dressing. Note-you can make this salad a day in advance. It keeps well. looks delish – honey & cumin…yum! Wow, I would never have thought to pair these flavours together, but I love them both, so I should try this out! I love any excuse to eat more blueberries during the summer. This looks delicious! This looks so refreshing! I heart blueberries! This looks so delicious and refreshing. Love it! Whoa – love this ingredient combination! Looks like a perfect dish for summer!! I’m not sure if this salad would be suited for everyone, but we’re adventurous eaters and love to try new things, so I would definitely make this. I’ve had blueberry salsa before and that was light and flavorful. There is an asterisk after the jalapeno pepper but no further comment. Why? I deleted it! No reason, just a typo:) I guess you could leave it out if you don’t like spicy! I know what you mean about catching up…I had to do grocery shopping yesterday and spent the whole day running!! A big bowl of this might give me the burst of energy I need. wonderful idea! We are addicted to blueberries over here! Can’t wait to see you in a few more weeks! I can’t believe it is only a few more weeks! Can’t wait to see you! Looks like we’re on the same page with blueberries! I thought I was the only one who liked to sneak blueberries into different recipes. This looks scrumptious! woah… blueberries and corn? Love this idea! Perfect summer salad! Your salad recipe definitely makes me feel like I’m soaking up some rays at a picnic. Looks so refreshing and delicious! Can’t wait to see some photos from the convention! I did the same thing yesterday. We had NO food in the house which is funny since Pete was here with the boys. I think they must have gone out for every meal! This looks like it would be the perfect salad for laying on a blanket in the sun! What a wonderful and colorful salad. I would never thought of pairing corn and blueberries. Great idea! You are wonderful too! So glad we were able to hangout! Wow! That is just bursting with summer produce! I can’t wait until both blueberries and corn are available in Southern California! Can’t wait to try it! Beautiful color and flavors in this salad, Maria! Wow thats almost too pretty to eat. ALMOST. Looks delicious! This is beautiful Maria. I don’t think I would have thought to combine corn and blueberries but I can’t wait to try it! what a gorgeous combo! i love the subtle sweetness in both things – i bet it’s delicious! i have been making this since i saw it in better homes and garden…its a keeper, so yummy! Oh. My. Dear. I need to get on this before I freaking pass out. What a gorgeous salad! I never would have put blueberries with corn before, but it sounds wonderful! I was already on board, and then I saw the honey lime dressing and was pushed right over the top. That’s a fascinating combo!!! I’m curious to try it! I don’t think I would have thought to add berries to a salad like this, but it looks really refreshing. Perfect for a picnic! Love it! Maria this sounds incredible! Not surprising because it reminds me of a strawberry corn salad I have on my blog from a couple summers ago. I will have to try it with blueberries! Ok, this is not a combo I would ever think of!! But, it looks so pretty and delicious! Just found your blog and can’t wait to browse around. I just so happen to have corn AND bluberries in the fridge, so I stumbled upon this recipe at the right time. I love this! I never would have thought to combine blueberries with corn, but it looks great and I love extra fiber boost! Yum! Great looking salad! Such a unique side dish for a simple summer supper! what a fun and different salad! i love the addition of the blueberries, in fact, i have a whole container in my fridge right now 🙂 must try this! I’m thinking this would make for a fabulous father’s day salsa! Yum. Delish. I forgot how much I love the combo of blueberry and sweet corn! Wow, this looks like summer in a bowl! 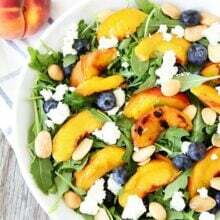 The local corn and blueberries haven’t started to arrive yet in my corner of the world, but when they do I’ll have this salad bookmarked to make. Thanks for the recipe! This salad looks so light and refreshing, any salad that has fruit and veggies is a winner to me. I made your coconut granola the other night and holy crap, I’m in love. I think it’ll be a new staple in my diet! Thanks so much for the recipe! This is such a creative way to use blueberries. I never would have thought about this combination before. Can’t wait to give it a try! I eat 2 cups a day! What an interesting combo! I am definitely going to try this recipe this summer! Thanks for the great idea. I never thought to combine blues and corn… but that’s dang brilliant! Thanks for including a link to my salad too! Wow, I would never have thought about mixing blueberries and corn except in a muffin or some cornbread. It sounds like a side for my next BBQ..
I’ve never tried the fresh corn/blueberry combo, looks like I’ve been missing out! This looks great! So colorful and flavorful – I love your use of fresh fruits and veggies! Great way to keep it healthy! 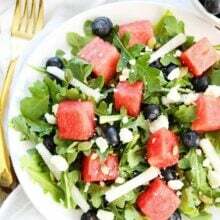 What a yummy looking salad, I want to make this for a BBQ tomorrow I’m wondering if I should mix it all together tonight or just keep it separate from dressing and mix it all when ready to serve. What do you think? And thanks for the wonderful recipe! I’ve made it the day before, with everything mixed together. It tasted great the next day! Enjoy! Yummmm. I love corn in salads, especially if it’s grilled corn. 🙂 Nice and cheap too for college summer days! love the idea of adding fruit to the corn! I could eat this all summer long, yum!! I tried this recipe from BHG a couple years ago, too, and fell in love with it. I’m always looking for new things to do with blueberries since I’m blessed with 10 great bushes! I like your tweaks — and since this is blueberry season here, I’m ready! I love fruit & veggies salads. This looks beautiful. I need to try this. My friend made this salad and it was scrumptious! I would like to make it tonight but am out of fresh corn. Could I somehow use frozen corn instead? Sure, you can use frozen corn! I made this last night and it was delicious. I just used raw corn because it was too hot in my kitchen to boil water. 🙂 Thanks! After seeing your “20 summer salad” recipes, I picked this one for a weekend BBQ/potluck. It was very tasty- thanks! The blueberries sort of looked like olives, so I think that fooled some people. I will make it again. LOVE this salad! Was a huge hit at a pot luck with the office staff. Will definitely be making this again…will probably have to double the recipe next time! Pingback: Broccoli Salad - Never Enough Thyme — Never Enough Thyme - Recipes with a slight southern accent. This was great!! I used four ears of corn and grilled them – soaked in water first and then grilled for about 20 minutes on medium. Was super yummy. Perfect flavor combinations. we added some cooked chicken and it was delicious! This was wonderful! Will make this again. Everyone loved it! Yay! Glad it was enjoyed by all! So can we add nuts and grains into this recipe? This is my favorite summer salad for 2018! I would never think to put these ingredients together but they are perfect. It gets rave reviews and lots of recipe requests. Thanks for the fabulous recipes! I make this all the time and it always gets rave reviews! So easy and fresh! But I forgot to rate it! 5 stars for sure! Thank you for the feedback! Glad you like the salad! Just wondering if you could make this without cooking the corn? I make a few different corn salads and don’t cook the corn. Is there any way to make this into a canned product? It seems like if we can make pickles or succotash, then there ought to be a way to can this up, right? Perfect summer side dish! Super easy to make and full of flavor. I thought it taste even better the second day. And as a bonus it was a great way to use up much of my garden produce.